Over the past few months, you may have seen commercials for a Phantom of the Opera-esque beauty treatment, a plastic mask full of glowing lights that promises clearer skin. Like glycolic acid peels or at-home laser hair removal, it is the latest product to act as a holy grail: something that was once relegated to the realm of those who could afford a trip to the dermatologist or aesthetician, but can now be purchased at your local drugstore. “Yes, I know it looks like something out of a science fiction movie, but trust me,” fresh-faced former Disney star Olivia Holt says as she twists Neutrogena’s Light Therapy Acne Mask in her hand in a commercial. “With the clinically-proven light therapy dermatologists use, its blue light penetrates just beneath skin’s surface to kill acne-causing bacteria, while its red light goes deeper to release inflammation,” Holt explains in another spot for the $40 mask. The technology Holt is shilling you is not brand-new, but one that started as a discovery made by scientists before eventually making its way into the hands of only the rich, and then, the slightly less rich but privileged enough to be on the cutting edge of aesthetically focused knowledge. Years later, it has trickled down far enough that it is now available in a place devoted solely to the American masses—a Walgreens near you. In the fall, I got to experience what that step before the general public gets something feels like, to lie in what is touted as “The first LED bed to receive over-the-counter FDA clearance.” I received a PR invite to participate in a “VIP” experience by lying in the LightStim Professional LED Bed at dangene: The Institute of Skinovation (yes, “skinovation”) in Manhattan. I was promised that stars such as Kate Beckinsale and Rosie Huntington Whiteley were already fans, that the bed itself cost $65,000, and that a 40 minute treatment (provided to me for free) would run $300. I immediately said, yes. I wanted to lie in a bed of light. But first, some science. At first glance, the Neutrogena mask seems to fit right in with the Clarisonic, another recently developed tool with numerous imitators that promises miracle acne relief and better skin. The Clarisonic, though expensive, can be used for at least several years before crapping out entirely—so long as you replace the brushes (like an electric toothbrush) you’re good to go. But despite its seemingly sturdy quality, the Acne Mask is good for only 30 uses, meaning you’ve got to re-up on “Activators” pretty regularly, which seems wasteful to say the least. 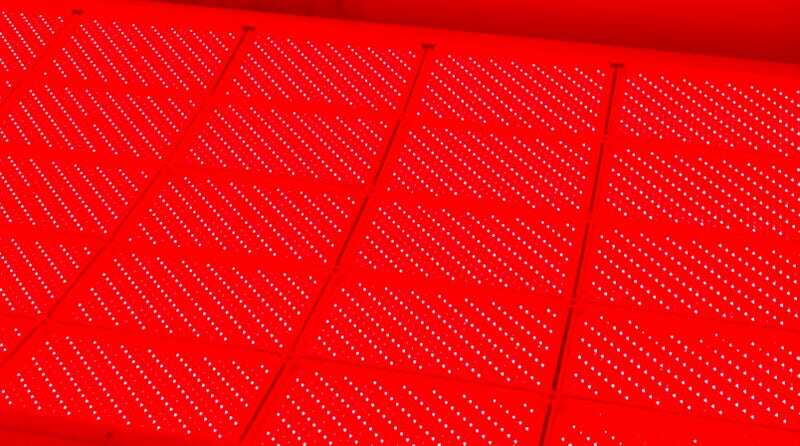 This disposability is not so for the LED bed. Essentially, Neutrogena is re-marketing technology that has been available over the counter in a few different forms, albeit more expensively, for a several years, and at a doctor’s office for longer than that. The mask uses different colored LED lights (a technology one might first associate with environmentally friendly lightbulbs), and each color tackles a different problem in the body; amber, deep red, light red and infrared lights work on wrinkles, blue lights target acne, and light red, deep red, infrared and deep infrared lights can help pain and inflammation, even deeper into the muscles and joints. NASA is actually credited with helping to develop this technology, and several studies done in the past decade have confirmed the efficacy of LED treatments on a variety of skin-related ailments; one study in the Journal of Cosmetic Dermatology found that 74 percent of subjects using a handheld LED light treatment “reported a visible improvement in fine lines and wrinkles at 8 weeks post-treatment.” Another found that many patients reported significant improvement in acne with LED light treatment, and basically no side effects. The benefits of at-home LED tools for aging are not quite clear, but the claims that the masks and wands work for acne are more solid. The only catch is that they require regular use; think of the mask as prevention of acne, not a permanent cure. For a workable analogy, it’s like a topical treatment, not Accutane. At this point, the evolution of LED technology from something developed by scientists for purely health reasons to embraced by the beauty community is indicative of the industry’s ever-present fascination with the latest and greatest—and the highly competitive nature of the field. Many companies have variations of LED technology, so much so that new ones that have attempted to gain FDA certification for their wands, masks and beds have simply gotten a nod that, yes, this has been done before, and no the FDA won’t ban you from releasing your product but they have not made a judgment on whether they’re particularly effective, just that it doesn’t seem to be harmful. But not all of us can afford the bed, and that’s where its many iterations step up. Consider them an Olay cream competing against Crème de La Mer; there is a quality difference, to be sure, but the biggest one is price. Upon arriving at dangene, I noted that it was close to my dermatologist’s office in Midtown, which makes sense, given that he caters to a clientele of mostly rich women who like their skin health with a hefty side of looking good forever. Upon entering dangene, I was greeted by no fewer than five PR professionals and staff members. They were all dressed in black which, against the entirely white office, gave the place the vibe of a very small Westworld. They were all calm, smiling and insistent I take some sort of beverage. (I took water.) Eventually, I was handed over to Samantha, the technician who would guide me through my treatment (and the treatment of several other young women who heeded this PR email’s call). Samantha had what I can only describe as a carefully calibrated face—smooth, poreless, very very pale skin. This was capped off by dark hair and, obviously, an outfit of black. The experience of lying on the LightStim Professional LED Bed is very strange, because it’s like what I imagine lying on a tanning bed is like, except the intent of the LightStim Professional LED Bed is to make your skin better, not fry it into a cancer scab. First I stripped down to my underwear in a tiny room slightly larger than the bed. I had been instructed beforehand to come with “clean, makeup free skin” and to not “wear any makeup, excessive fragrances or lotions,” which meant that I entered this land of perfect individuals looking decidedly tired and run down. Samantha said I could apply a serum to my face (the first ingredient in it is water), though what I took away from our exchange was that it could help the treatment work more effectively but it also didn’t matter if I used it at all. There was a selfie stick available for pictures that I did not utilize, though I did take a picture of the bed. A fun detail is that if you take a picture of LED lighting it looks completely different than it does in real life, which is to say I believe it was orange. And then I lay there, for 40 minutes (20 on my front, 20 on my back), with a set of lights placed over my face for a portion of the time. I was warm but not uncomfortably so; it was like lying on the beach on a nice day. It was like guided meditation, but no one but the light was guiding me. It was like massage, but no one but the light was touching me. It went by fast. Afterwards, I dressed and met with Dangene herself and LightStim CEO Steve Marchese. My face was flushed and my body was warm, and as I perched on a stool in a tiny office before these meticulously groomed individuals I felt—despite my obsession with our body’s largest organ—woefully unprepared to converse with them. Me in the dangene bathroom post-bed, slightly more rosy than usual. Marchese told me that thousands of aestheticians use LightStim around the country—their original wand, the thing that’s most similar to the Neutrogena mask and the many other seemingly similar products on the market from other companies. But according to him, “The bed is a whole other level” to the whole body wellness game (despite the fact that this general technology appears to have been utilized by another nearby spa for a few years now). The rest of our conversation was a flurry of buzzwords—ATP, nitric oxide, free radicals, toxins—and I found myself smiling and nodding. Yes. Yes. Yes, light bed. I don’t know if the LED bed did anything; from what I’ve gleaned from reading up on this stuff, one treatment is not enough to really prompt a change, and I certainly couldn’t imagine making room in my schedule or my bank account to go regularly. But dangene, LightStim, and everything related to these strange words are nestled in the increasingly popular cross section of beauty and health, creating a realm of people who care about looking good to a degree that they believe in a beauty that is more than skin-deep, though not in the way people mean when they talk about how good people are beautiful. It’s not enough to wear make-up to look as if your skin is perfect—better to have perfect skin even before you put makeup on it. Concealing seems to have lost out over revealing, or maybe it’s just that you’ve got to be flawless before you cover up in the first place. Even better is if the treatment is minimally invasive—gone are the days when a full facelift was the solution. In the world of wellness, you have to look good and feel good, and this trip into the light quite literally represents that. Soon after my time with the LightStim Professional LED Bed, I went over to my friend Frannie’s house. She’d just purchased the Neutrogena mask in a flurried fit of winter self care and eagerly put it on, immediately looking like a young Darth Vader. I asked her this week what she thought about it. But her commitment to it didn’t last long. “I used it like 10 times and then forgot about it but was considering digging it out again,” she said.